The efficiency and on stream time of axial and centrifugal compressors is important for many production units and utility systems. Surge, in particular, can cause system downtime and increase energy use. The flow reversals every few seconds cause severe vibrations that can damage compressor seals and shafts reducing compressor efficiency. And the loss of forward flow often initiates shutdowns of production lines. 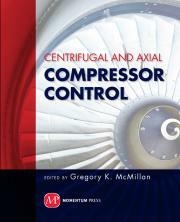 This book provides a comprehensive view of compressor surge and stall based on first principles and case histories. The process and installation conditions that affect the surge curve and the severity of surge are detailed along with the dynamics of the surge cycle. Solutions are offered to reduce the occurrence and consequences of surge. Since the surge phenomena is so fast, there are exceptional requirements for the automation system to prevent surge. This book describes how to design and implement faster than normal control valves and transmitters. The essential use of an open loop backup to quickly recover from surge is detailed. Key concepts are listed to summarize important ideas and to provide insight. Questions and answers for each chapter help verify that the concepts and details are understood. A process control background is not necessary to learn and employ the system design requirements presented. This book should be useful for automation engineers, mechanical engineers, and process engineers. Gregory K. McMillan is a retired senior fellow from Solutia Inc. During his 33 year career with Monsanto Company and its spin off Solutia Inc, he specialized in improving loop performance, controller tuning, valve dynamics, opportunity assessments, dynamic simulation, fermentor control, pH control, and reactor control. Greg is the author of more than 80 articles and papers and 20 funny and serious books.